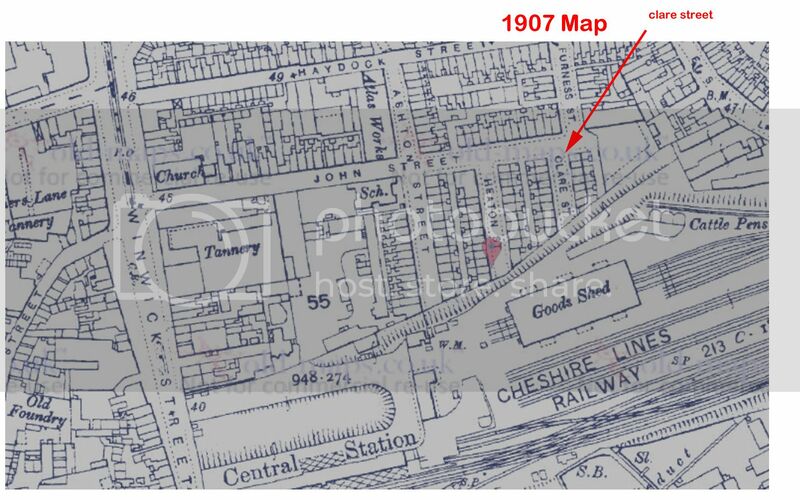 Hi mikehesk, Clare Street was not far from Winwick Street and Central Station. Here are a couple of old map I've marked up for you which show where it was. It's not actually named on one of them but as that's a clearer street map I've marked it accordingly. If you click on the images whey will enlarge. Interestingly enough Dizzy, the 3 Pigeons pub on Tanners Lane is still show railway lines hopefully from when it was a station. 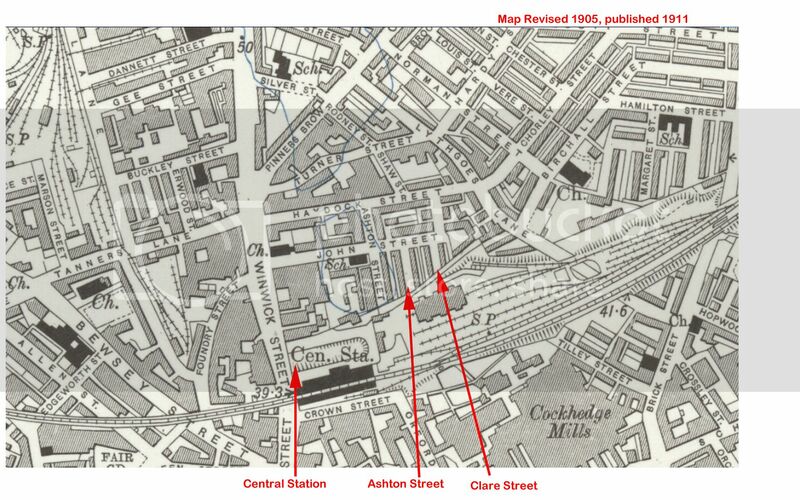 clare street is still there then though not shown as such on the maps. quick look on google maps and it is where t.j. mullins motor repair is. wow thanks I would never have found it ..which map is it marked on out of interest. It's show on other years from before and after too but I only uploaded those two. and the Church shown on Winwick Street I'm guessing is now called "The Boultings"
Ahh yes and well spotted Baz. I just looked on google street view and you are right. St JOHN (LADY HUNTINGDON'S CONNEXION) situated in Winwick Street, on the comer of John Street. HISTORY. The congregation dates from 1806 when Episcopalians from St James', Latchford, Presbyterians from Cairo Street and members of the Stepney Chapel formed a new church. The chapel was opened in 1808. The congregation moved to Back Dallam Lane in 1833, returning to their original chapel in 1854. Part of this congregation moved to the Salem Chapel in 1853. This church became Presbyterian in 1854. It was reopened in July 1889 after alterations and refurbishment. The congregation eventually moved to Wilderspool Causeway in 1910. The Winwick Street building is now used for commercial purposes. REGISTERS. The Liverpool and SW Lancashire Family History Society has published a transcript of the Baptisms from 1806 - 1837.